Dear Jen, I hope you can help me. I learned to play flute just after my amazingly oversized front teeth came in, when quite young. Somehow I ended up using my upper teeth to create an embouchure, instead of my upper lip. I pull my upper lip up and out of the way and actually form my tone using the edge of my top teeth. Now, of course, my teeth are normal sized because they have been filed down by the dentist. But I never knew about this unusual method of mine until my second year in highschool when I received some photos of me playing with the band, and for the first time I saw how my embouchure differed. How do I go about fixing this? My tone is okay, but very breathy, especially when I try to play high notes. Thanks in advance for any pointers. M.
You are not alone. There was a flute-playing "Miss America" contestant in the 1970s, I believe, that played on TV, using her upper teeth instead of upper lip, and was startling in that she could smile brilliantly at the audience, all through her televised flute solo. Of course you need to re-work your embouchure from the beginning again, and it may be frustrating, but it will be well worth your efforts. The first thing to do is to find a qualified flute teacher and sign up for six months worth of weekly lessons. This is not likely something you can fix yourself,because there are several factors that are going to have change for you to get a better tone quality than you have now, and you'll need to do fundamental exercises to strengthen new muscles that surround your lips. Also you'll probably need to start placing the flute differently on your chin, adjusting your angle and lower lip shape, as well as opening the jaw hinges, and blowing downward by drawing the top lip down and over the teeth. These are too many things to "spot" yourself for while learning. A good flute coach will "spot" you and help you just like a good gymnastics, dance or swim coach can analyse physical movements much better than the athlete can themselves. So do go to the best teacher you can find. 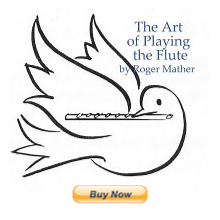 Meanwhile, here are some pictures from the book The Illustrated Fluteplayer, which is a handy resource. But you will need a teacher who specializes in flute. If you click directly on these pictures, they will get larger. Use the Back Button to return here. The first few days of work may result in a "beginner's tone quality", but you'll have to be patient with this as your facial and mouth muscles gradually adjust and gain poise and strength for the new embouchure. I find that I get just a little freaked out when I hear that band flutists have never even seen a flute teacher, or had the flute teacher see them. Of course if you'd gone to a year of flute lessons at any point, this could have been fixed before it came as a surprise to you. But now, since you're motivated, NOW is the time for flute lessons. This very basic how-to video contains one helpful flutey hint, about making an "m" with your lips, and then blowing the lips apart in the center. Give it a try and let us know if you're able to do this exercise. That will tell you how easy it is to re-design your musculature. There is also a video with embouchure exercises here. All the best, and hoping your new flute teacher fixes you right up. Be patient, and be motivated.